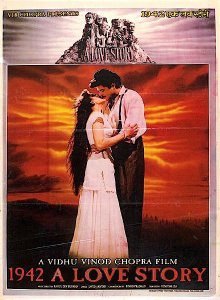 1942: A Love Story is a 1994 Indian Hindi patriotic romance film starring Anil Kapoor, Manisha Koirala, Jackie Shroff, Anupam Kher, Danny Denzongpa and Pran. The first Indian film to use Dolby Stereo, it was highly acclaimed for its music, songs, picturization, cinematography, lyrics and the portrayal of leading lady Manisha Koirala, a turning point for her career. The film received fourteen nominations at the 40th Filmfare Awards, winning nine. Naren's father, Diwan Hari Singh (Manohar Singh), is a loyal British employee, while Rajjo's father Raghuvir Pathak (Anupam Kher) is a revolutionary fighting against British rule. When Naren asks Raghuvir for Rajjo's hand in marriage, Raghuvir becomes livid. Naren declares that he is willing to sacrifice everything for Rajjo, and convinces Raghuvir of his love for her. Pathak relents and tells Naren to talk to his father. When Naren does so, Hari Singh is angry that his son has chosen Rajjo, the daughter of a revolutionary, but pretends that he will do anything for Naren's happiness. Hari Singh tricks Naren into revealing Pathak's secret location, and leaks the information to the British authorities. Soon, police barge into Pathak's hideaway and try to kill him, only to find him waiting to light a bomb. He kills them all, dying with them. Rajjo, who was out at that time, realizes what has happened and runs away. She is taken into refuge by Shubhankar (Jackie Shroff), a compatriot of Pathak who has learned of his death. Under Shubhankar's tutelage, Rajjo follows her father's revolutionary path. Meanwhile, Naren is angry with his father for being used as a pawn in the ambush and killing of Pathak and driving Rajjo away. Promising to make up with Rajjo and help her cause, he pledges to become a protester or a revolutionary, opposing his own father. The location was mostly chosen from Himachal Pradesh, District Chamba and its small town Dalhousie, Khajjiar and Kala Top was filmed to depict pre-independence India. The film's original songs were composed by R.D. Burman with lyrics by Javed Akhtar. R.D. Burman won his last Filmfare Award for Best Music Director and Javed Akthar bagged the Filmfare Award for Best Lyricist. Kumar Sanu won his 5th consecutive Filmfare Award for Best Male Playback Singer and Kavita Krishnamurthy won the Filmfare Award for Best Female Playback Singer, the first of her Hat-trick feat. The music in the introduction of the film is from Gustav Holst's The Planets - Mars the bringer of war. The film was released some time after the death of music director Rahul Dev Burman. The film's adjusted gross amounts to Rs 896.4 million and was declared a "Hit". Best Lyricist - Javed Akhtar for "Ek Ladki Ko Dekha"
Best Male Playback Singer - Kumar Sanu for "Ek Ladki Ko Dekha"
Best Female Playback Singer- Kavita Krishnamurthy for "Pyaar Hua Chupke Se"
^ "The Screen Sound of Silence". 11 July 2011. ^ "Movies: I, Me, Myself...Manisha Koirala,a love affair". Rediff.com. Archived from the original on 7 June 2011. Retrieved 8 June 2011. ^ "1942 A Love Story". Ibosnetwork.com. 15 July 1994. Retrieved 9 September 2011.